Mordian 7th Regiment: Iron Hands - Batch painting complete! Whew! Twenty five guys done, and based on the notes I took while churning through 'em, the overall time spent was just a little shy of ten hours. Not too bad! First up is the tac squad I'd shown previously, with the multi-melta being replaced by a missile launcher and a bit more dust and mud on the legs. The second tac squad carries a plasma cannon and plasma gun, I figure with all the Gets Hot rolls, it just means they're more likely to get some extra bionics! Next is a devastator squad with a couple extra heavy weapons to swap in and out as needed. Always handy! A few extra characters were mixed in the assembly line as well, including a pair of techmarines and a librarian. 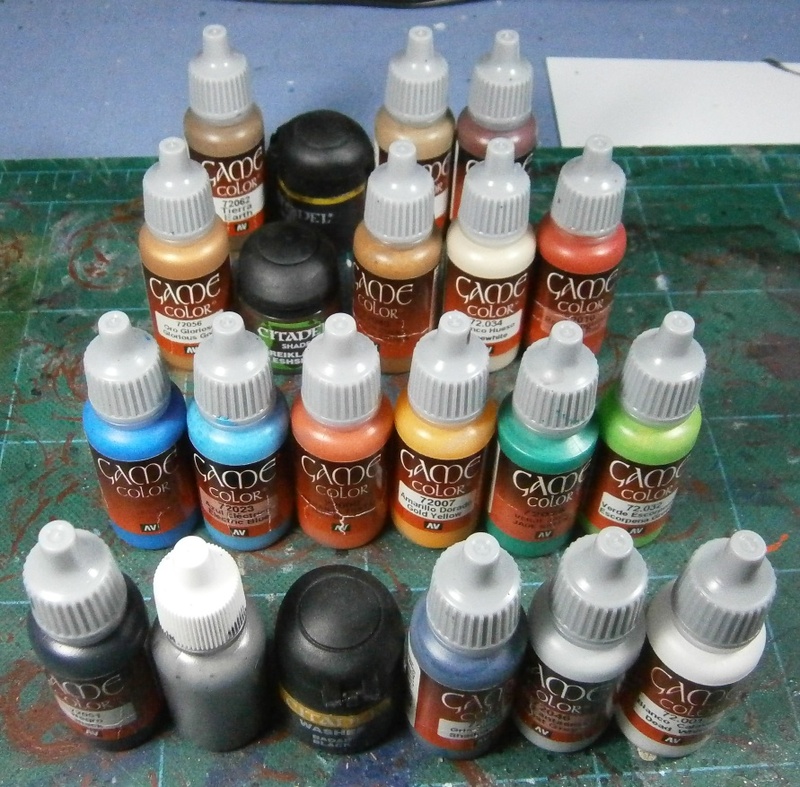 For what I thought would be a relatively simple paint scheme, there are 21 colors that go into it. How did that happen? I'll be the first to admit this is not my best work, I was more focused on speed than technique - I will definitely be taking more time working through the heresy-era Iron Hands. That said, I figure even if the painting time doubles, I will still be able to finish up the upcoming army before January! Impressive stuff, both quality and quantity. I find it really hard to consciously sacrifice quality for speed so my batch painting takes ages, this is great to see. Mightily impressive, 25 minutes per marine is fast. I'm like Scipio, sacrificing quality (what little I can achieve at least) for speed just doesn't come easily. 5 marines at a time and I still take a month or more to reach a similar standard. Just a suggestion, but I would apply a thinned ink wash to the blue areas since it's a bright colour and with a stark transition to the dark of the armour it's showing up all the little imperfections caused by the speed painting. All said 25 mins a figure is pretty damned good! @Colonel Scipio: Thanks, I kept wincing internally while banging them out. I am definitely going to be spending more time on the heresy guys. @Andy - bG: I appreciate it! Gonna have to strike a balance between quality and quantity, looks to be about 65 marines on deck soon. @Sir Tainly: Aye - I think that every color is going to get one more shade and/or highlight on the heresy models (wash on the blue, an additional highlight on the metal, etc.). Think they'll definitely benefit from the extra step(s). ", the overall time spent was just a little shy of ten hours." Ponders shipping an army to you as I'll NEVER paint that quickly & still have it look good...lol. Still, done swiftly or not, I think they look really cool. Bravo. @Da Masta Cheef: Hah! I appreciate the thought! They look great, a true testament to batch painting. Also are there necromunda pitslave weapons mixed in there? @LuckGod: Thanks! Sometimes quantity has a quality all its own. Indeed - there's a half dozen or so pit slave bits scattered throughout, good eye! Ah Necromunda, source of much fun, and many bits!